Turn your Microsoft Surface into a virtual hotspot! As of Windows 10, Microsoft has shifted away from Hosted Network, the protocol that was originally introduced in Windows 7 to allow Internet Connection Sharing on PCs. Hosted Network has been replaced with the new Wi-Fi Direct feature, breaking almost all applications and instructions for turning a Windows laptop into a Wi-Fi hotspot. Starting with their Surface Pro line of computers and tablets, Microsoft has eliminated the Hosted Network feature entirely. It seems like Microsoft has decided not to tell this story, but instead spread it across a number of documents. And they make it even more confusing by calling the old API “Hosted Network”, “SoftAP” or “Extensible Access Point (ExtAP)” in different documents. So what’s the deal with Connectify Hotspot? Connectify Hotspot is the only application that can successfully create a Wi-Fi hotspot on all Windows 10 computers, because we support the Wi-Fi Direct APIs. When Microsoft began telling developers that the Hosted Network protocol would be deprecated as of Windows 8, we started exploring how to leverage the new Wi-Fi Direct feature to make a Hotspot on Windows PCs. As we finally started to see laptops rolling out without any Hosted Network support at all, we knew it was time to ensure that Connectify Hotspot could also leverage Wi-Fi Direct in order to create a wireless access point. 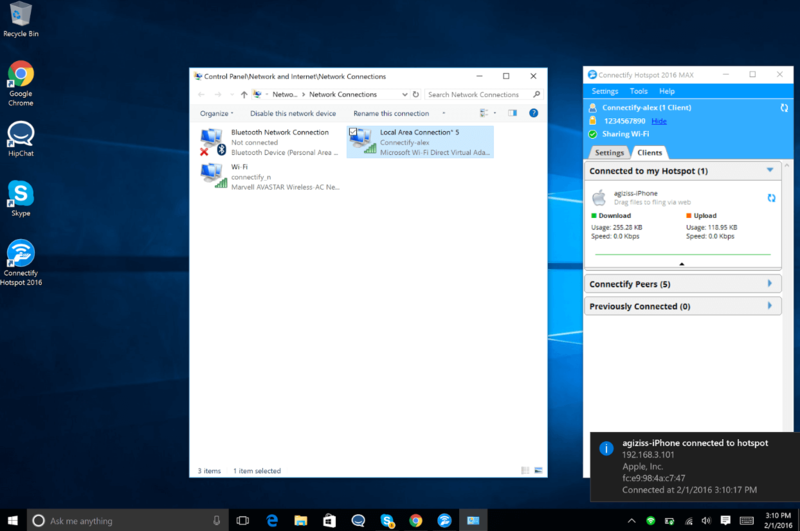 Today, Connectify Hotspot is the only solution for turning your Surface or Wi-Fi Direct-only Windows 10 PC into a virtual hotspot! 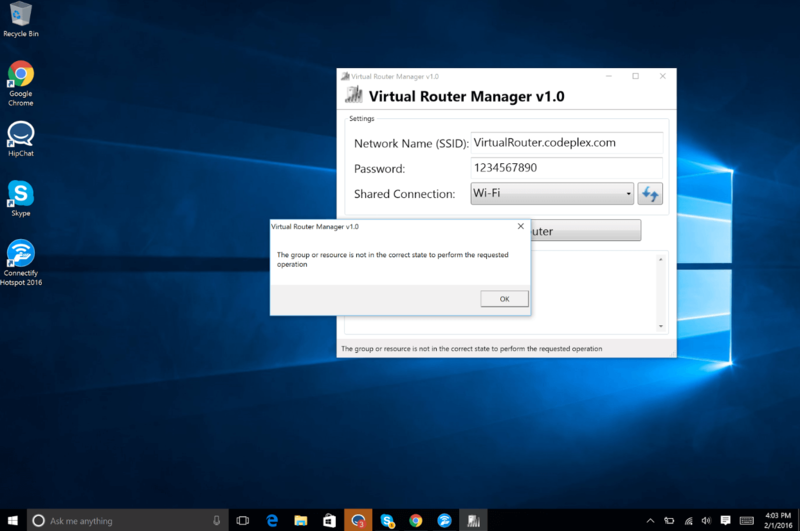 In a nutshell, as of Windows 8.1, Microsoft deprecated the Hosted Network (or SoftAP) feature that all virtual router applications rely on to share your PC’s Internet connection as Wi-Fi. This means they are telling developers to not use it in any new applications, and are warning that it will soon go away. Their new solution is the Wi-Fi Direct API, which allows much of the same functionality, in a more standardized way. Just take a look at this support document, where they tell software developers that they should only be using Wi-Fi Direct and not the old API. Moreover, As of Windows 10, the driver level support for this feature has gone from required to optional. And the Wi-Fi vendors are taking them up on this, we’ve seen drivers from Marvell, Realtek, and Intel that don’t support Hosted Network, and we expect this list to grow. Microsoft has gone all the way with this, launching the Surface Pro 4, with no support for Hosted Network at all. 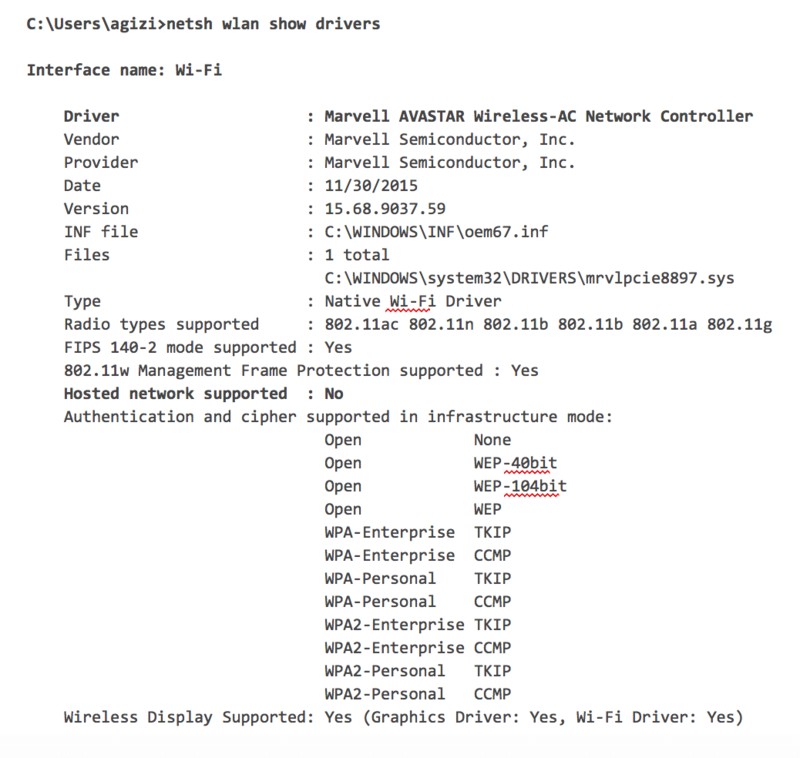 The Surface Pro 4 uses the Marvell AVASTAR Wireless-AC Network Controller as its Wi-Fi chipset. To see that it doesn’t support Hosted Network, open a cmd shell and run the below [emphasis added]. Essentially, there’s no way to start a hotspot on your Surface Pro 4 using Virtual Router and other Wi-Fi sharing apps. Connectify Hotspot is the only app that works seamlessly with this – see below. Currently, the only way to share Wi-Fi on your Surface device is with Connectify Hotspot. 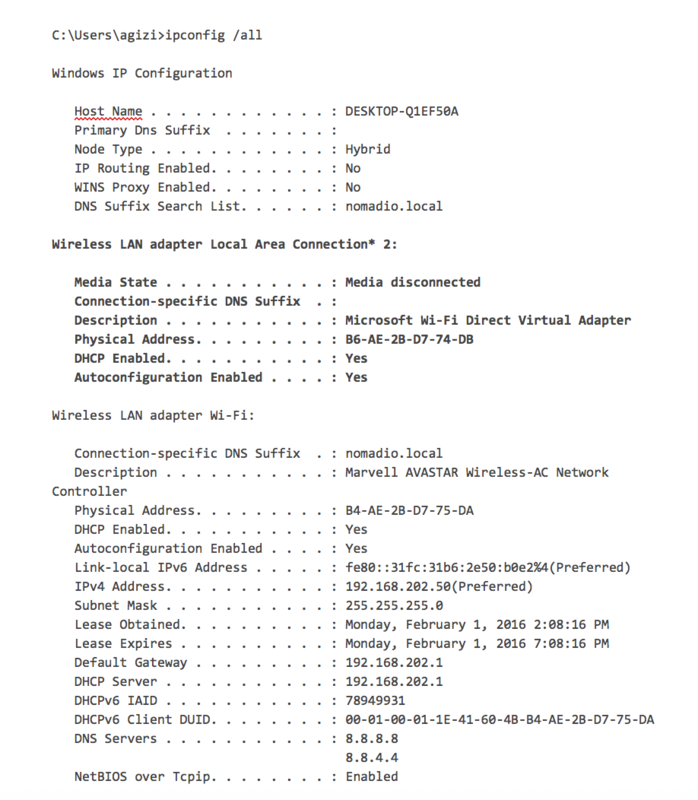 To check for Wi-Fi Direct support on your Windows computer, just run “ipconfig /all” and check for an entry called “Microsoft Wi-Fi Direct Virtual Adapter”. As you can see below, the app intelligently uses the “Microsoft Wi-Fi Direct Virtual Adapter” whenever it’s the best choice.If you’re a Surface owner, or have any Windows 10 PC, Connectify Hotspot is the best (and only) solution for turning your laptop into a Wi-Fi hotspot as wireless card manufacturers continue to drop Hosted Network support in droves. Connectify Hotspot does more than just sharing a Wi-Fi Internet connection via the same adapter; you can actually share any type of Internet connection (3G/4G/LTE, Ethernet, Wi-Fi dongle, tethered phone) via Wi-Fi or Ethernet. There are also advanced firewall, DHCP and IP settings you can benefit from, as well as a Repeater Mode, Bridging Mode and even Gaming Mode. 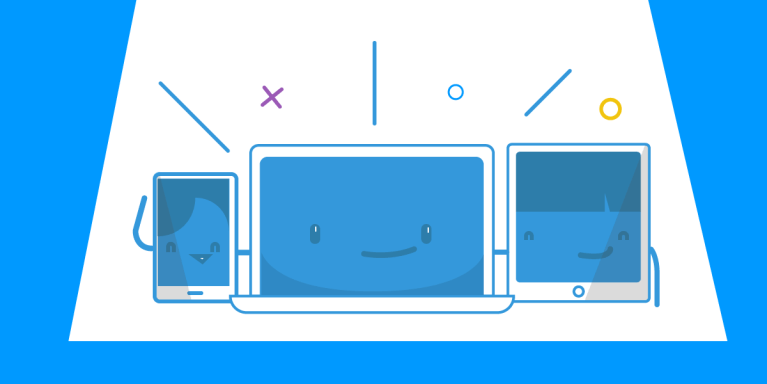 All of these make sure your devices will be able to connect seamlessly between them and to the Internet. Plus – it’s great when traveling, saving you both time and money! Our software app available for Windows also features an intelligent ad blocker and the possibility of setting up a Wi-Fi hotspot name using emojis. The program is available in 10 international languages with more to come. Transform your Surface PC into a versatile tool and share the Internet across all your devices. Get started for FREE – no email sign-up necessary!